There have been growing reports of IncrediMail (now Perion), a popular Windows email client, are not working well on Windows 10 machines. It appears that crashes, bugs, and more issues related to supporting new Windows 10 updates have cropped up recently. There are also several reports of malware that have lead many users to seek alternatives. What should you be looking for as an alternative? The bottom line is, email clients need to be concerned with increasing productivity, and effective organization. These elements should work together cohesively to make the user’s life easier. At a minimum, email clients need to consider that everyone is using their software in various business contexts such as fast-paced environments, in-office or out in the field. A solid email client should not only be able to adapt to these environments but should also be fully functioning after operating system updates. It needs to keep up with this ever-changing technological world – and that’s a demanding task! That’s why we rounded up all the windows email clients for a review. Here are the best alternatives to IncrediMail Windows 10 users who are looking for a similar experience. 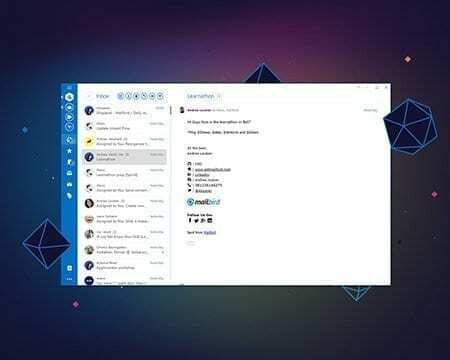 If you were a big fan of IncrediMail’s customization options like backgrounds, and custom effects, then Mailbird 2.0 is the best alternative on Windows 10 today. Mailbird is an intuitive, smart and effective way to organize emails and communicate with colleagues, clients, customers and professionals. 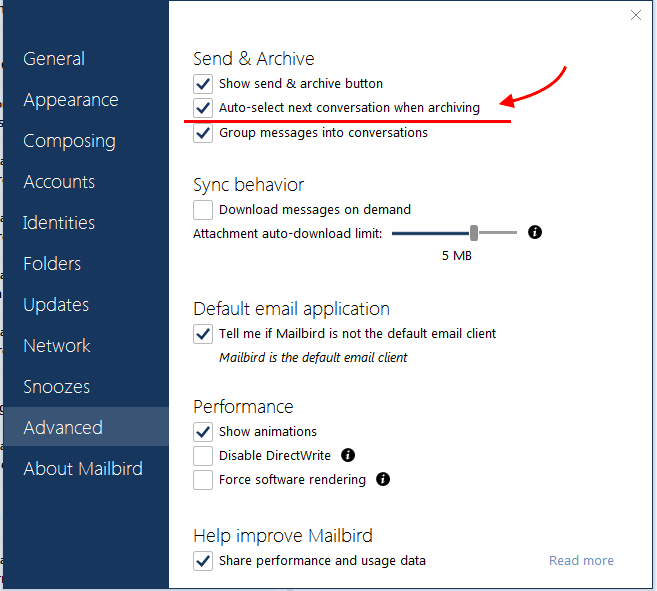 Here is the full run down on what Mailbird 2.0 has to offer. LinkedIn Lookup – Connect your email to LinkedIn for an easy integrated way to connect professionally! Quick Action Bar – archive, snooze, reply, forward, trash that email, mark as important, star or mark as spam…all within 2 inches of your mouse. Quick Preview of Attachments – View your attachments before downloading them to avoid downloading unnecessary content. You can snooze emails during busy times and selectively filter out what kind of email you receive at a given time. Snooze can also be used to remind you of tasks instead of a calendar reminder. Speed Reader – This function helps you scan long emails quickly. Train your brain to read faster, sift through content and find the information that is relevant to you! Unified Inbox – Unified inbox lets you integrate all of your email accounts into one user interface. If you have more than one email, it archives your various folders into one tab that is easy to distinguish. You can unify two emails (like let’s say a work account and a personal account) but keep a third account separate of the two! It’s up to you. 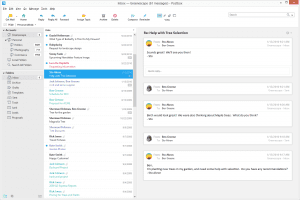 Mailbird also takes it a step further by bringing the entire client interface into the mix with options for enhancing its interface with colors, layouts and custom patterns. 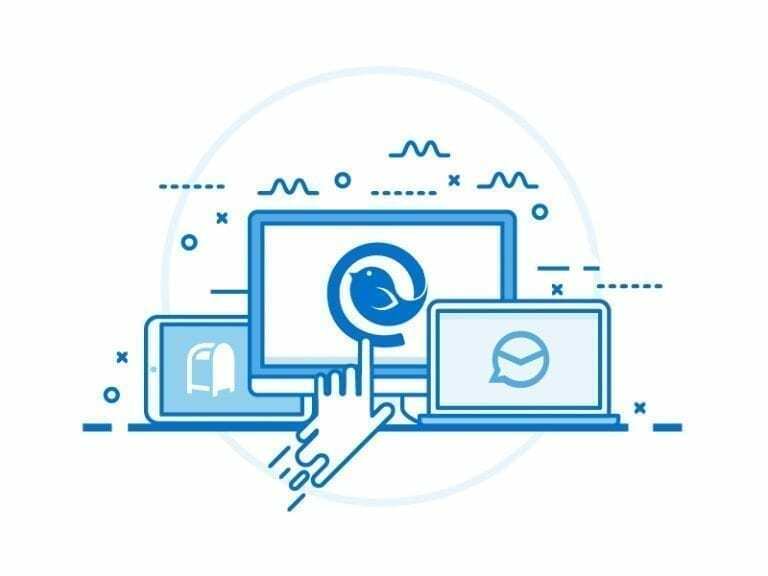 A unique aspect of Mailbird is that it has also teamed up with developers to integrate social media apps, video chat apps, organization and task apps, calendars, note taking, contact management apps and more. These are add ons you can add into your interface to create the ultimate customized communication platform. Try the best alternative to IncrediMail today! 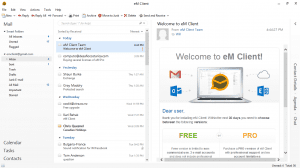 eM client is another Incredimail Windows 10 alternative. It has a very bare-bones easy-to-use email interface that operates on Windows XP, Vista, 8, and 10 – perfect if you have an old computer still running previous operating systems. This could be a great option for somebody who is new to using email interfaces or for someone who doesn’t need a whole lot of communication platform add-ons. While it does have less UI customization options, it does present a solid and secure communication system equipped with message encrypting, mass mail and delayed send, a built in email-translator, templates and signatures and more. eM client’s calendar is highly customizable allowing you to integrate internet calendars, tasks and to-do lists effortlessly. Share calendars and tasks with other colleagues, friends, clients or customers. Use the full-text search in events and tasks; send meeting invitations and confirmations, schedule meetings and more. eM client gives you custom contact views, an extensive number of data fields, categorization and folders support, easy access to communication history, an easy way to search for emails from specific contacts and most of all makes merging contacts from various addresses an easy task. 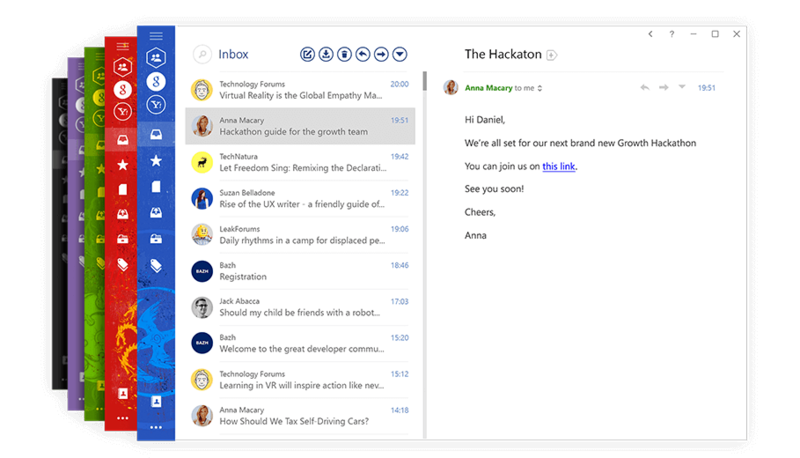 Postbox is a relative newcomer to the Windows email client scene, but it’s already received high praise for its clean and simple interface. Unlike Mailbird or eM Client, it does not offer a free version. However, Postbox does offer a free trial so you can give it a try on your Windows 10 device. • You can now add dynamic data in Postbox 5 in responses and templates. This means placeholders automatically populate with data from the message itself or through your own custom fields. 70 professionally written email response templates for job inquiries, recruitment letters, reference requests etc. Anti-tracking – a function that allows you to see when your emails are being tracked to keep your information as private as possible! There are many more alternatives out there, such as Outlook, Thunderbird, etc. However, Mailbird seems to be one of the most effective tools in comparison to many other email software. They’ve managed to win awards since their release date in 2013, continually improving upon their services. Their goal to create an uncluttered, intuitive, and user-friendly interface is an effective solution for email organization. Not to mention – their app integrations have allowed them to continually push the envelope in the field of email communication. Are you a Windows 10 user? Try Mailbird 2.0! Did we leave out your favorite email client? Leave a comment on what you use, and why you prefer it. Editor’s Note: This post was originally published in January 2016 and has been revamped in January 2017 and updated for accuracy and comprehensiveness. 15 thoughts on "IncrediMail Windows 10 Email Client Alternatives in 2019"
the best in IM is notifier working permanently in the background. it even starts automatically with win. is there any other email client with that great function? I know you can set Mailbird to start on Windows startup, I am not sure how it works with the other clients to be honest. Click Start > Settings > Update & Security > Windows Update > Advanced Options > View your update history > Uninstall updates. Scroll down to the Windows updates, click on KB 3132372. At the top, click Uninstall. That’ll get rid of the bad patch. Your IM should work again. IM is way behind, and their tech support (for those who need it) is awful. Is it possible to turn off mailbirds mail preview panel? It by default is opening every email, and i afraid it going to open the wrong one and infect my whole PC. Hey Hamid, thanks for your message. There is currently no way to switch it off really. You could enable “Download on Demand”, that might slow down the process of opening the email though. Let me know if you found that helpful at all. Is it possible to get emoticons as one has in IncrediMail? Hey Veni, thanks for reaching out. Can you create your own stationary for Mailbird? After losing mail in Win10 Mail and going back to Outlook.com, which has become too confusing for the casual user, I tried Mailbird. It was great. Got all my 3 accounts into it along with contacts quite easily. Then I got the dreaded notice that it would cost $, which was not earth shattering. Just not used to paying for email program. I passed on the upgrade then suddenly lost one of my email accounts. I contacted them and received note back indicating that the free version no longer accepts use of more than 2 accounts. I left and went back to Win10 Mail. A few days ago I got a notice saying that my watermark was reached at the roadrunner site so I went in to clean SOME of the mail out and left others. When I went back to Win10 Mail, ALL my mail was gone. So here I am again looking for another email desktop or web based. Looking at Inky, Incredimail, etc. Sure wish Mailbird would let folks know that the Free Version cannot carry more than 2 accounts. Found Mailbird to be misleading. Too bad. I really liked it.